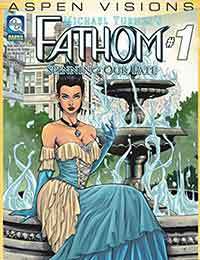 Aspen Visions: Fathom: Spinning Our Fate Average 0.00/5 - out of 0 total votes. In the tradition of DC’s Elseworlds and Marvel’s “What If?” classic stories comes Aspen’s most mind-bending concept ever—ASPEN VISIONS! The second thrilling chapter continues here as part of a special three part mini-series spanning across Aspen’s most popular titles—Fathom, Soulfire and Executive Assistant Iris! Just how does Executive Assistant Iris encounter Fathom’s preeminent heroine, Aspen Matthews, for the first time ever—and how does it all take place in the Victorian Era?! You’ll have to discover for yourself in the pages of this second of a three-part event in the pulse-pounding launch of the all-new ASPEN VISIONS line of books that will shatter everything you know about Aspen’s most popular characters!